The Macallan 1926 in a bottle painted by Michael Dillon. There was a world record price for a bottle of whisky at Christie’s in London today when The Macallan 1926 sold for £1.2 million. The 60 year old malt in a unique bottle painted by the Irish artist Michael Dillon came up at Christie’s sale of finest and rarest wines and spirits. The previous record of £848,000 was established at Bonhams in Edinburgh earlier this year. The Macallan distillery located near the river Spey in North East Scotland was founded in 1824 and produces stunning examples of cask-matured single malts, particularly their highly prized single-cask, limited edition bottlings and Fine & Rare Collection. The Macallan 60-Year-Old 1926 takes this rarity to new heights for collectors of Macallan whisky. Peter Blake, the renowned artist responsible for the album cover of the Beatles’ Sgt. 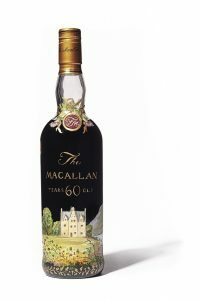 Pepper’s Lonely Hearts Club Band, and Valerio Adami were each asked to design a label for this special 1926 Macallan 60-Year-Old malt, and 12 individually numbered bottles from each artist were released after the whisky had spent 60 years maturing in ex-sherry casks prior to bottling in 1986. Less well-known was that one bottle of this ultra-rare elixir was commissioned and hand-painted by Irish artist Michael Dillon. The bottle depicts the Easter Elchies House of The Macallan against the backdrop of the Scottish Highlands. This entry was posted on Thursday, November 29th, 2018 at 5:00 pm	and is filed under AUCTIONS, COLLECTIBLES. You can follow any responses to this entry through the RSS 2.0 feed. You can leave a response, or trackback from your own site.